Are You Looking For High Quality School Assemblies Or Library Programs? Good News: Cris Johnson is here to help you! School Assembly Presenter, Author, Magician, Library Show Performer, and Speaker Cris Johnson. “HI! 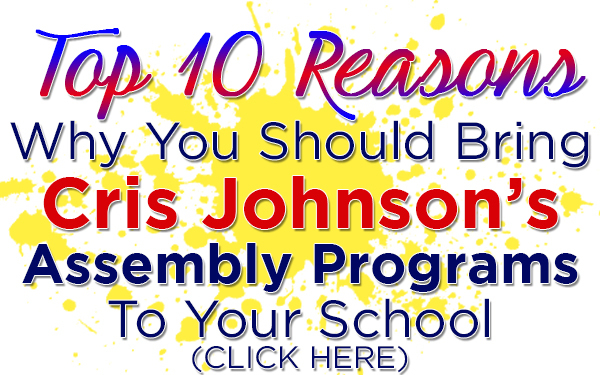 I’m Cris Johnson and for the last (nearly) 20 years, I’ve had the privilege of helping school officials make their elementary assembly programs unforgettable, educational, and fun with motivational programs consisting of magic, music, CLEAN comedy, and audience participation that reinforce the curriculum and encourage good character! “I know that looking for a performer for your school or library is a VERY important job. Let me assure you that with my services, you are getting a presentation backed by years of experience, a truckload of past happy clients, and my ‘Better-Than-Money-Back-Guarantee’. In other words, if you don’t think my program exceeded everyone’s expectations, then don’t pay. And here’s the BEST part: NO ONE has ever taken me up on my guarantee! After nearly 200 shows a year for nearly 20 years…well, that’s a LOT of satisfied clients! “I got started in performing back when I was just an 8 year old little boy. My parents bought me a magic hat playset and from there, I was hooked! Fast-forward about 15 years and I made the move to being a professional entertainer, performing birthday parties, holiday parties, and family events. It was great fun! But I wanted what I did to make a difference in people’s lives. You see, I was mercilessly picked on as a kid. Yeah, that’s what they called it back then: ‘getting picked on.’ I was bullied, plain and simple. There simply wasn’t the awareness we have now! “When I was living in Pittsburgh, PA several years ago, a friend of mine who was a motivational speaker saw what I was doing and urged me to incorporate messages into my magic shows. The first show I created was – you guessed it – themed around the topic of bullying. It took a LOT of work and research on my part, but eventually I had a fun, informative assembly program that really benefited schools, serving as a springboard to open up discussions on the topic of bullying in schools and more. “I loved creating and presenting that program! All these years later, I’ve created many, many other programs and continue to do so each year. I love what I do, helping kids of all ages navigate this fast-moving, strange 21st century! 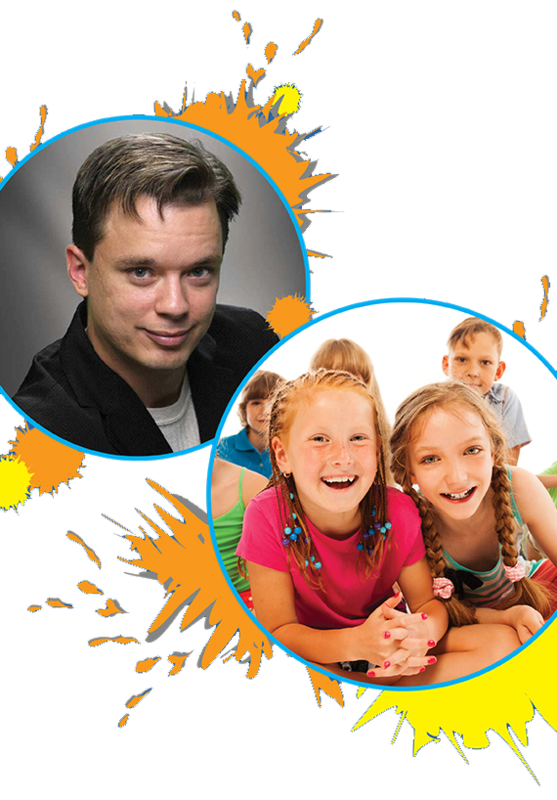 “I continue to help schools by making learning fun for students with my series of character-building & curriculum-based themed school assemblies and library shows. I currently offer several programs, including “Drug Free-That’s Me!”, “I Love To Read,” “Yes I Can!” (a Character Education school assembly program), and of course, my anti-bullying school assembly program: No Bully Zone!” as well as, “A Cat And A Hat!” (a Seuss-Themed assembly!) and “Wacky Science!” ALL of my programs use a ton of audience participation to get as many kids involved as possible.